This DIY describes how to replace chain and sprockets on a 2007 CBF1000A Honda motorcycle and is applicable for 2006 to 2010 models. This replacement must be done when the chain has elongated to the specified maximum limit. Depending on driving style, lubrication intervals and road conditions, this may typically be after some 40.000 km (27.000 miles). On my bike it was done at 40.400 km and again at 82.600 km. This is an easy DIY task, provided you have the right tools for it. It is also a task which for safety reasons much be carried out with care. You don't want the new chain to break while driving fast on the highway! A first timer may spend 5 hours or more doing it, an experienced might do it in 1 hour. 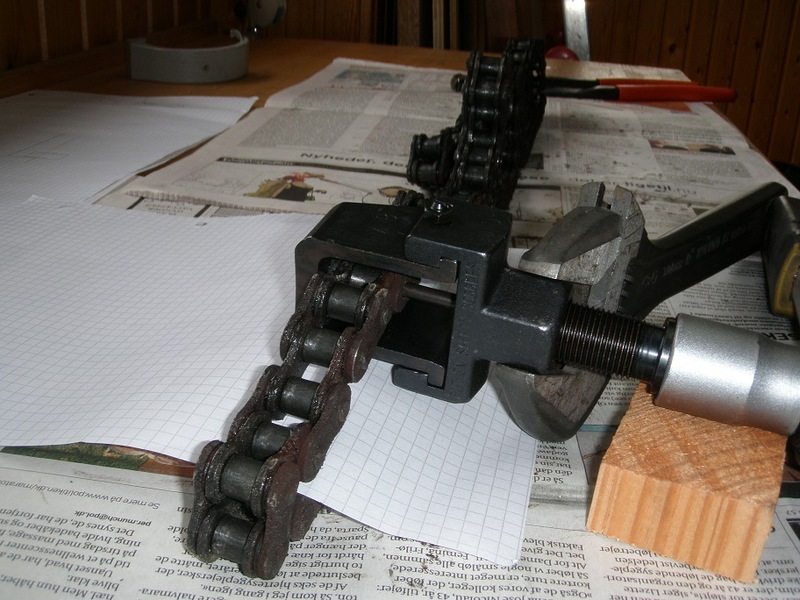 Chain rivet tool suitable for the new chain. I use a proffesional KM500R DID Chain Cut & Rivet Tool shown below. DID also has a less expencive version, but since I ever started collecting tools, I have always bought the best. Socket spanners (8, 9, 14, 22, 27 mm). Star and fork spanners (7, 12, 14 mm). 33 cm long wood stick to lock the rear wheel. 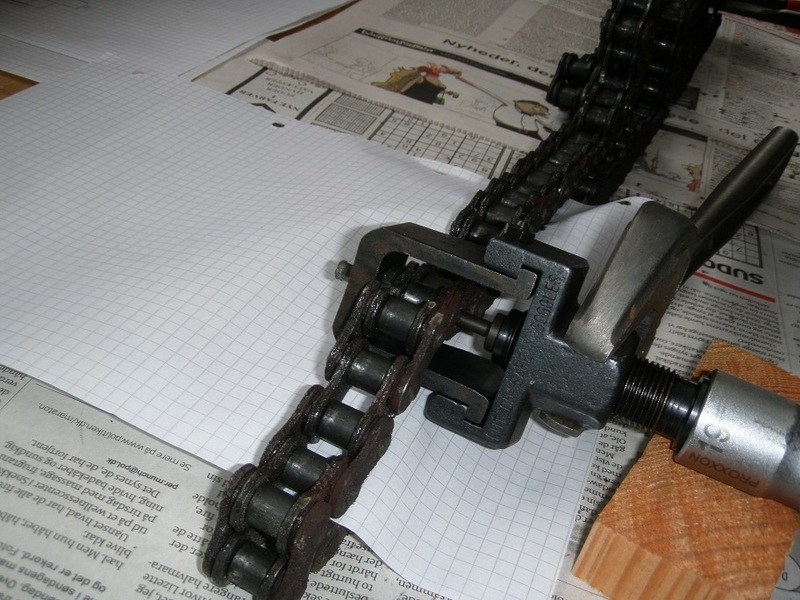 Chain kit compricing chain and sprockets, e.g. 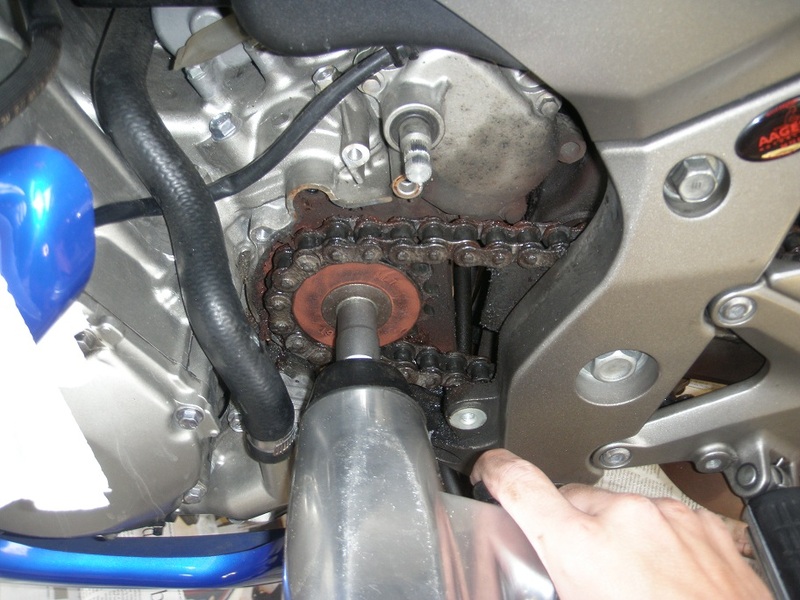 Honda part number 06406-MFA-D01 which comprices a DID chain (40540-MZ 1-216), a 16 teeth front sprocket (23801-MC J-75) and a 43 teeth rear sprocket (41201-MFA-D01). Drive Chain Slider as needed. This will last for many many kilometers. Even after more than 82.600 km I found it to be in good condition and still perfectly usable. It seems to wear less than 1 mm over 40.000 km drive. When doing DIY work you will undoubdtedly at some point run into troubles like e.g. stuck bolts or other things which will not come apart. 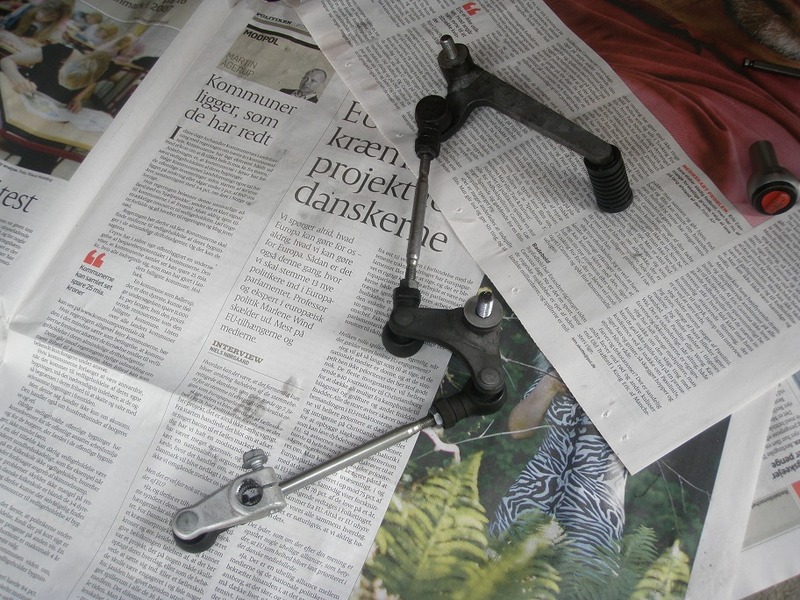 Instead of just spinning out of control using the big hammer, have a look here: " Undoing Stuck Bolts, Nuts and other Metal Parts". Remove the hugger for easy access (this step is optional). 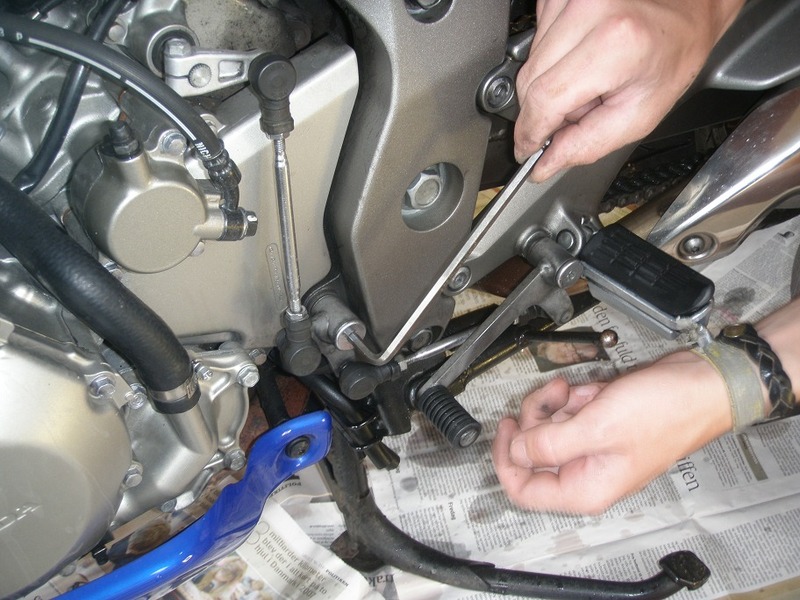 Remove the gear linkage (optionally only remove the gear shift arm). Remove the clutch slave cylinder and clutch lifter rod. Remove the front sprocket cover and guide plate. Remove the front sprocket bolt. Press rear brake caliper a little back, remove the rear wheel and remove the rear sprocket from the wheel. Clean away old chain-oil deposits, inspect chain slider and compare number of links on new chain with old. 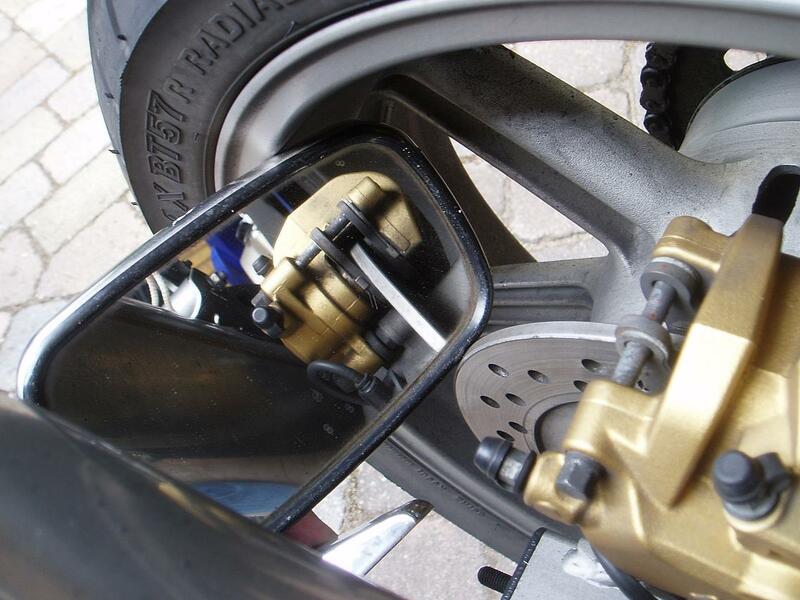 Mount the new rear sprocket (torque 108 Nm, 11.0 kgfm, 80 lbfft). Mount the front sprocket (do not tighten yet). Mount and rivet the new chain. Mount the front sprocket cover and guide plate. Detailed descriptions for each step are given in the following sections. 1.0 Remove the hugger to get easy access to the chain. 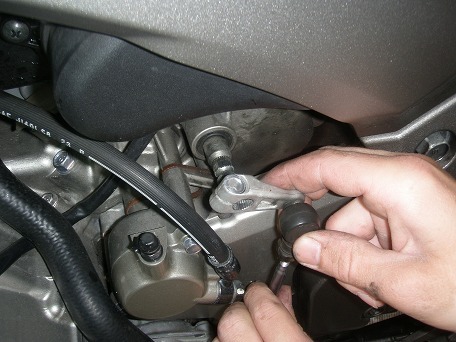 Unscrew the two lower bolts and remove the pinch bolt at the gear shift arm (above right). 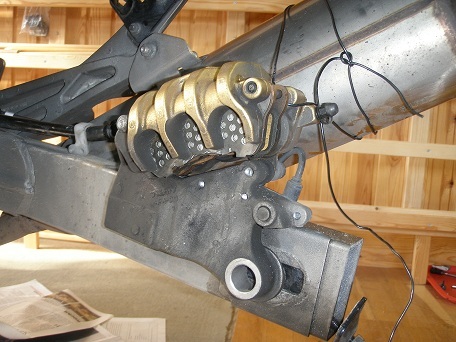 Pull the gear shift arm of the splines (below left). Notice the angle when you pull it off, so you can hit the same angle on reassembly (if you prefer, you really only need to unmount the gear shift arm and let it hang down). First place a "do not touch" label on the clutch handle. 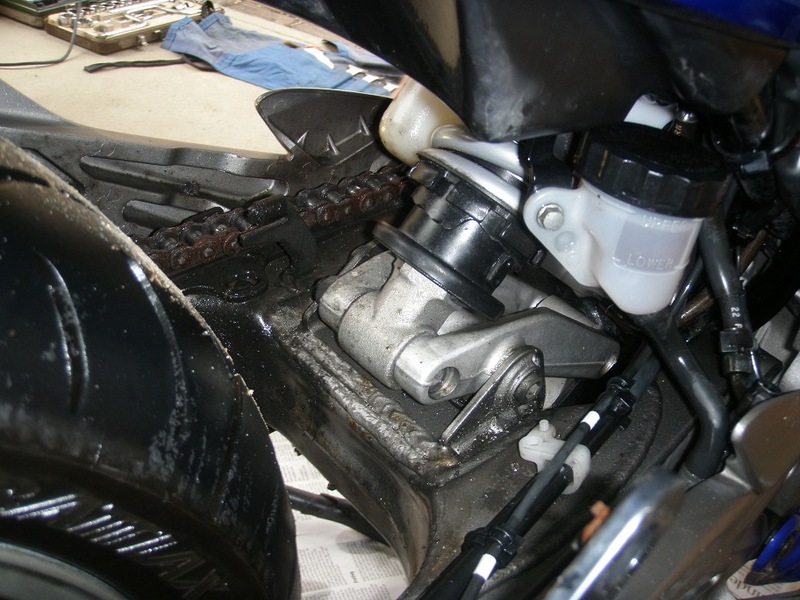 Then loosen and remove the two long and one short bolts holding the hydralic clutch slave cylinder. Pull the clutch slave cylinder away and let it hang to the left. 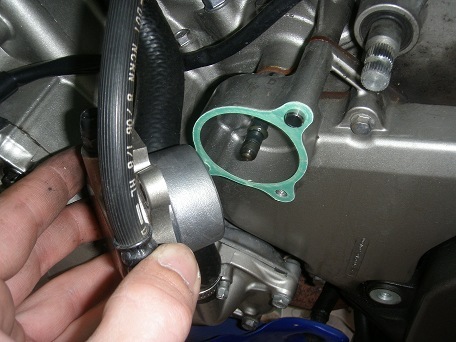 Be carefull not to damage the gasket. Pull out the long clutch lifter rod. This cover is also referred to as the left cranckcase rear cover. 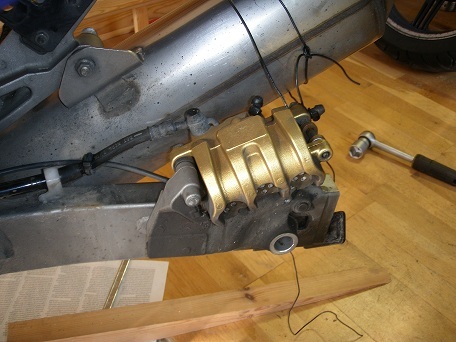 It is mounted with a socalled guide plate behind it, and is fixed into position by two dowel pins and two bolts. First unscrew the two bolts holding the cover. 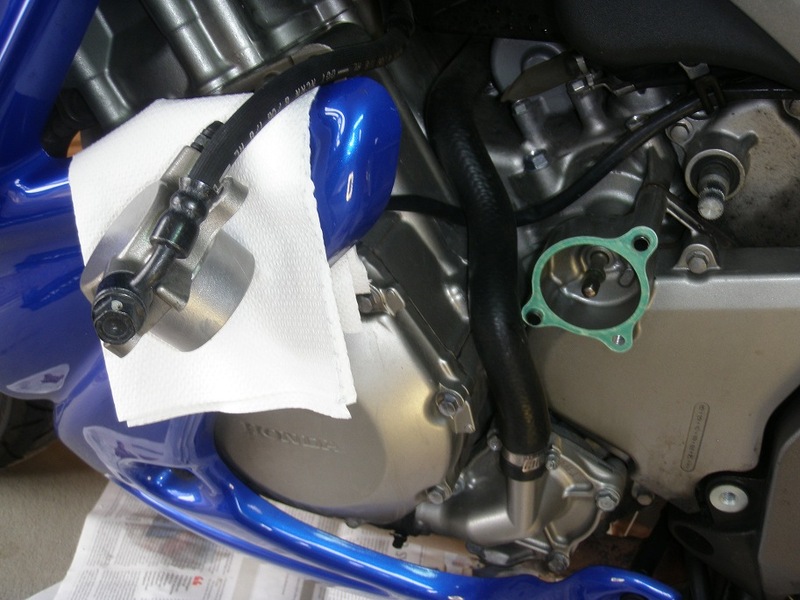 The cover is easy to get loose, but it may be a little difficult to get it past the rubber tube on the cooling water pump. The trick is to wriggle the guide plate off the dowel pins and away. Then there will be sufficient clearance to get the cover off. 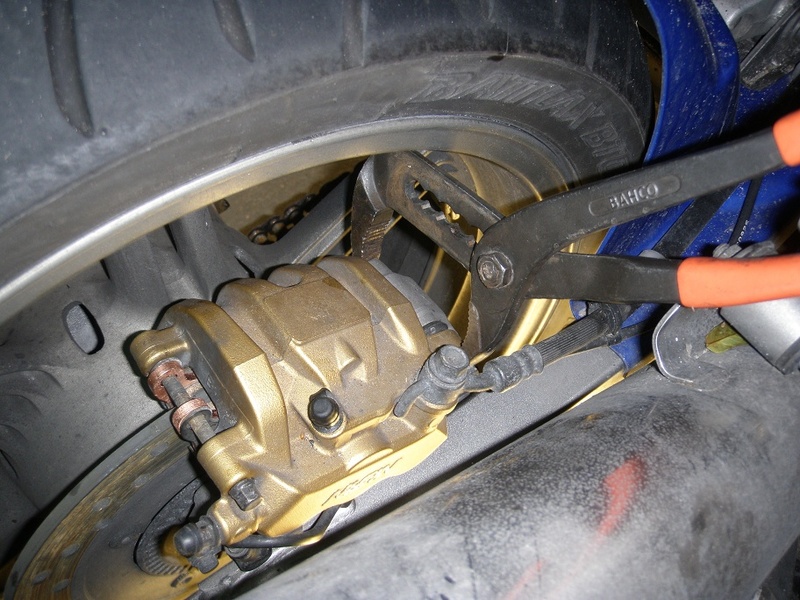 Place a 33 cm long wood stick through the rear wheel to prevent forward rotation (below left). 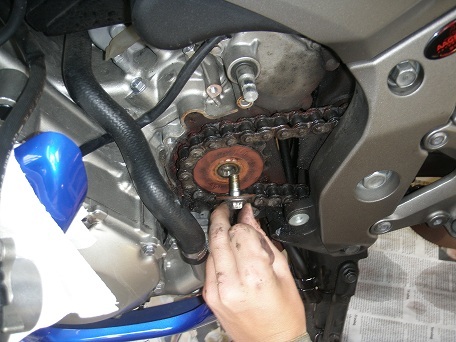 Remove the bolt holding the 16 teeth front sprocket. 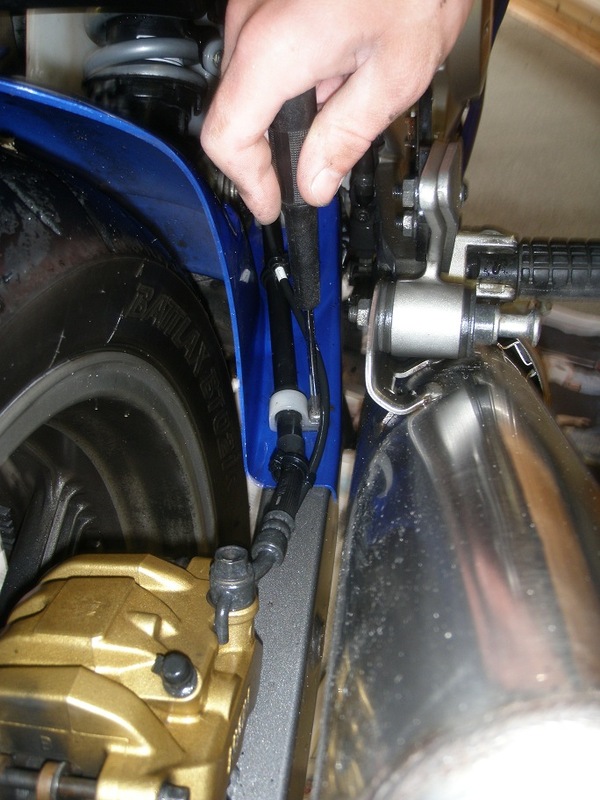 You must use a six edged 14 mm top for this as the bolt will otherwise be damaged due to the high torque required to loosen it. If you do not have a pressurized air tool, you may likely have to use a hammer on your socket wrench to loosen the bolt. I had no experience with KM500R DID Chain Cut & Rivet Tool so I decided to use an angle grinder to grind down two rivet heads on a randomly chosen link as shown in the images (below left). It only took a couple of minutes. 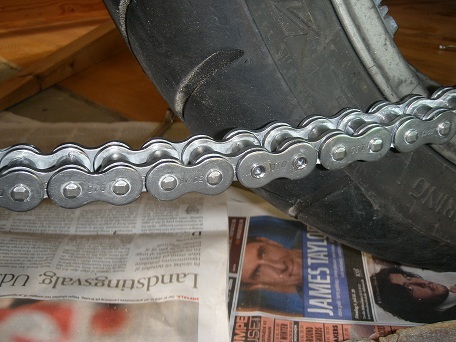 Then the chain could be removed. The connecting link plate is then removed with a screwdriver which is tapped lightly on the end with a hammer (third image from left above). 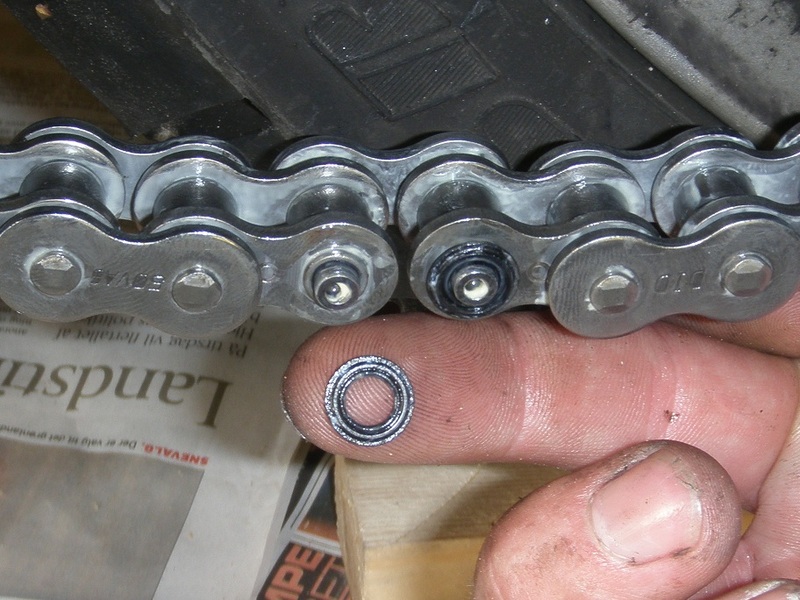 Finally the connecting link is simply pushed out and the entire chain can be removed. 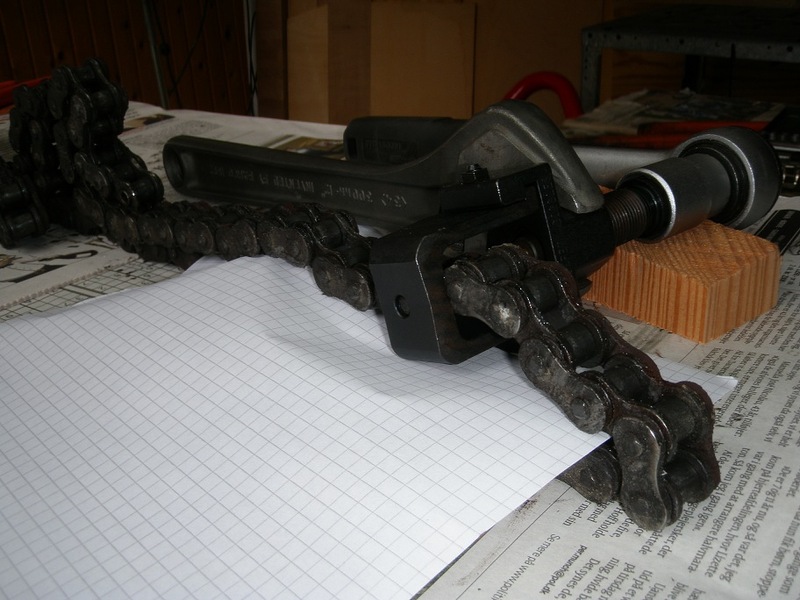 Later I broke the chain again with the KM500R DID Chain Cut & Rivet Tool as you can see in the following description and pictures. I found this to be much easyer than I first expected, so next time I will use this method. The cutting and rivetting pin is set into the pin holder with the long thin riveting pin pointing out. 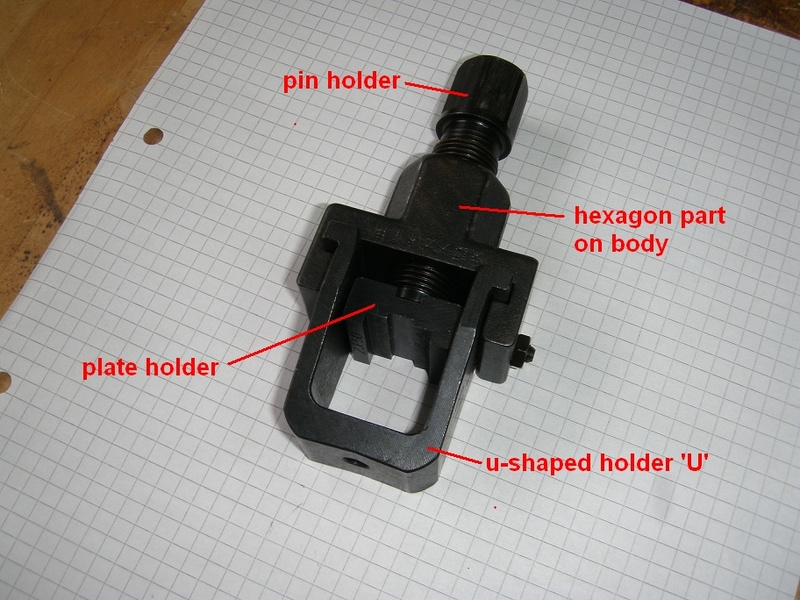 The u-shaped holder 'U' is moved in over the chain from one side, and the u-shaped holder is slided sideways into position A which is marked on the side of the u-shaped holder. In this position a small hole in the bottom of the U will be alligned with the riveting pin so the rivet can pass out through this hole. 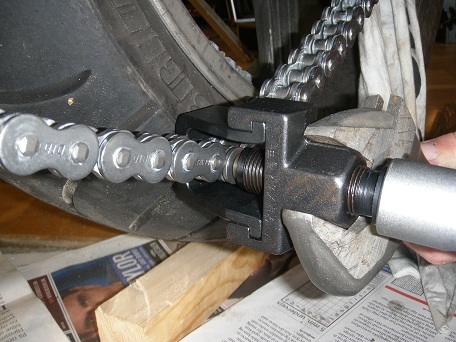 The riveting pin is positioned on the center of a randomly selected rivet head and pressure is applied by turning the 19 mm bolt, while holding contra on the 28 mm hexagon part of the tool (below left). 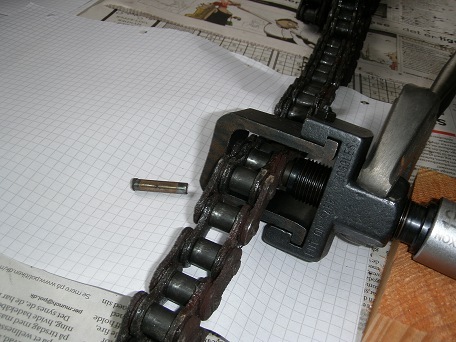 Continue turning until the pin is pressed completely out of the chain. Remove the tool and you're finished. Push the rear brake caliper a little back to achieve a gap as shown below (see more details in the Rear Brakepads Replacement article). 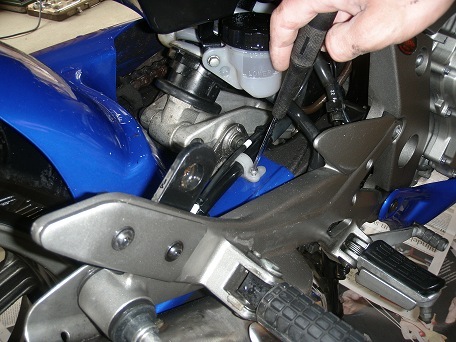 If hand force is not enough, use a helper or a pair of pliers as shown on the middle image below. 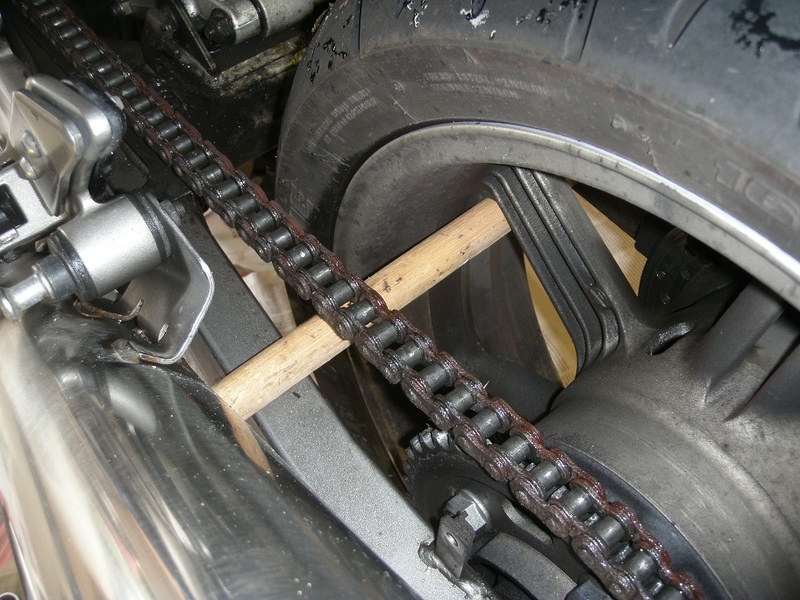 Place something under the rear wheel to take the weight of it when it comes loose. Then, referring to the Chain Maintenance article, back off the large chain adjustment nuts exactly the same number of turns on both sides - e.g. 20 turns. Tie up the rear brake caliper to the exhaust (below, second picture from left). 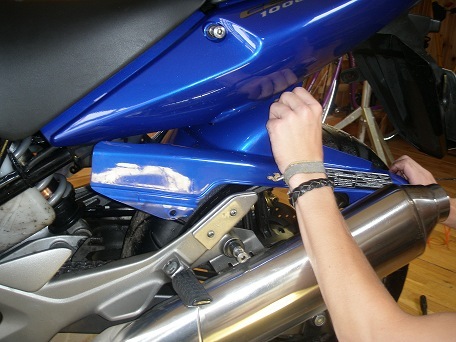 Then remove the rear axle nut on the right side of the bike and pull out the rear axle from the left side (below left). 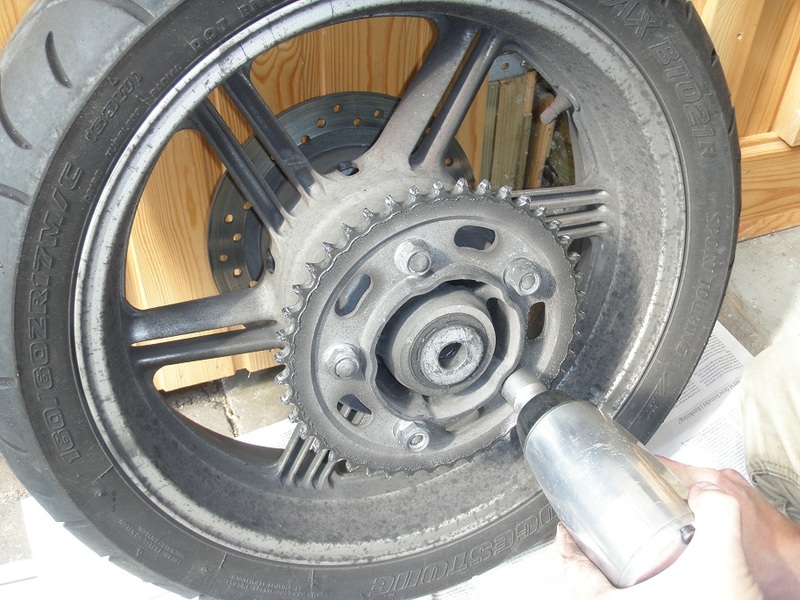 Remove the rear wheel. There is just enough space to get it out. 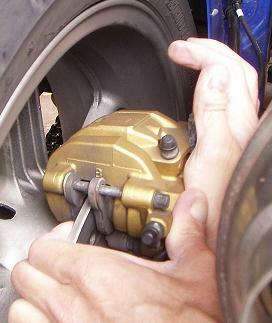 When you do this, it may happen that the front end of a brake pad is displaced sideways and dropps down so the pad is hanging down from the pad pin. 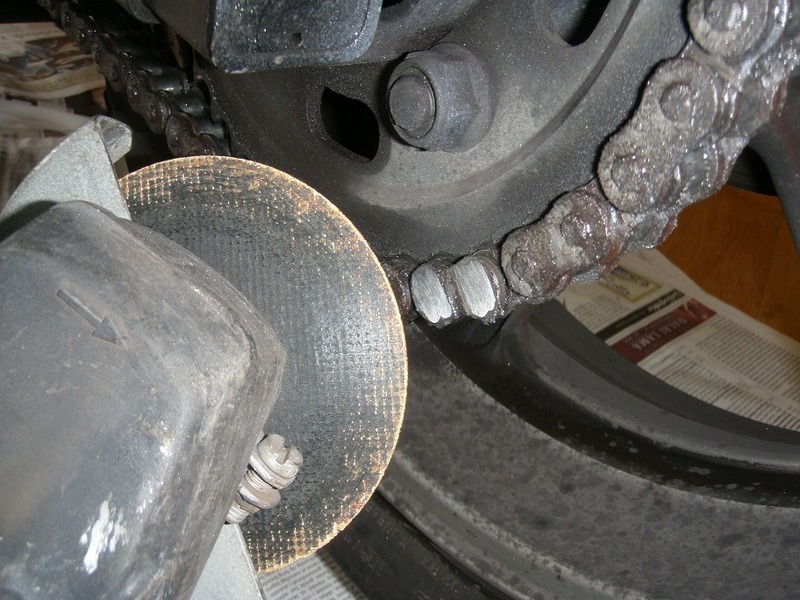 Should this happen, simply remove the pad pin and the brake pads completely and remount them when the wheel has been remounted. 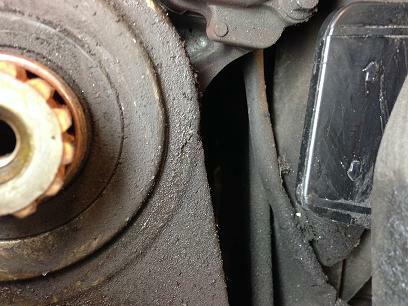 See the Rear Brakepads Replacement article for further details on this. Finally remove the 43 teeth rear sprocket (below right) by undoing the 5 nuts. OBS: Be carefull not to drop the rear sprocket unit out of the rear wheel hub. 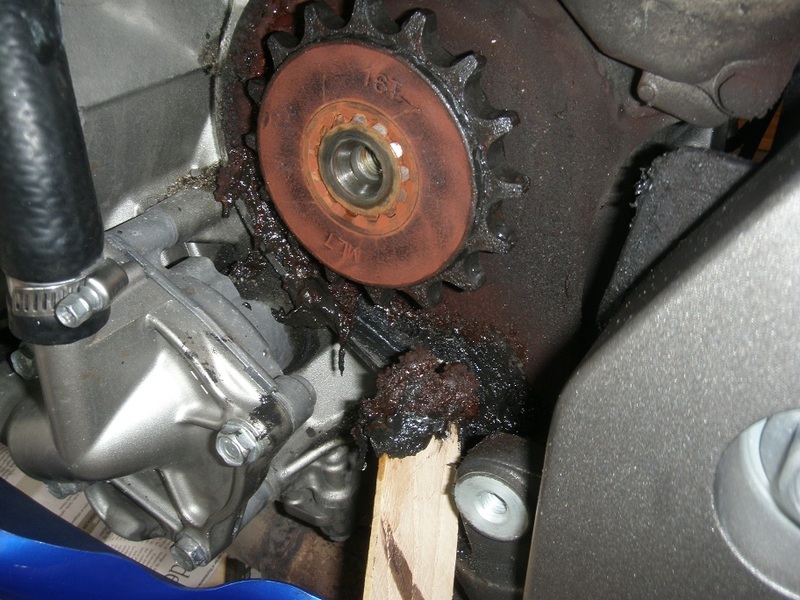 It can fall out if you turn the weel on its side with the sprocket down. Using e.g. 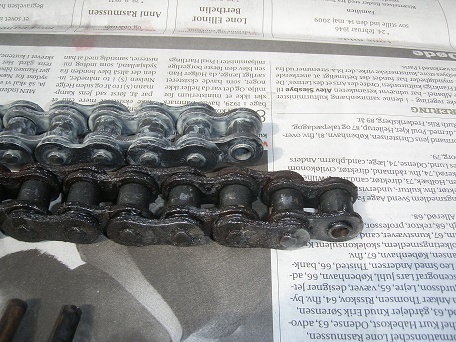 a thin piece of wood, clean out old chain oil from the area around the front sprocket and drive chain slider. 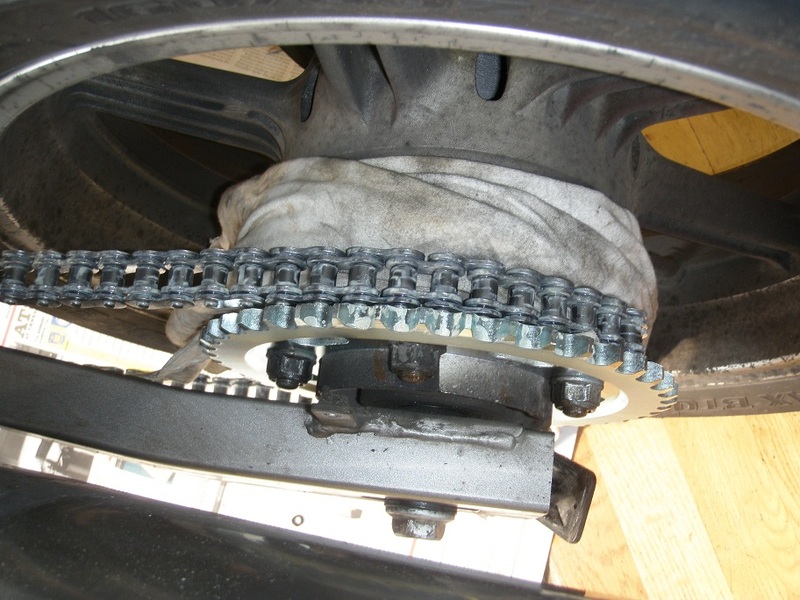 Check that the drive chain slider has not been worn too much down (image below middle at 40.400 km and right at 82.600 km). 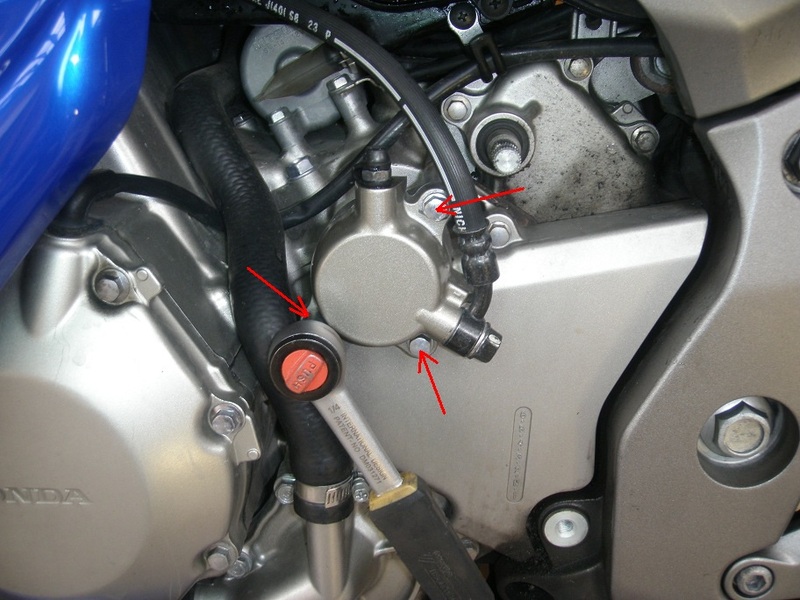 If it has been worn to either of the wear indicators, the slider must be replaced. Check that the new chain has the same number of links as the old one. Standard for this bike is 120 links with sprockets having 16 teeth at font and 43 teeth at rear. Notice that 120 links is the same as having 120 pins in total. Clean the threads and nuts for the rear sprocket and smear the threads with copper grease. 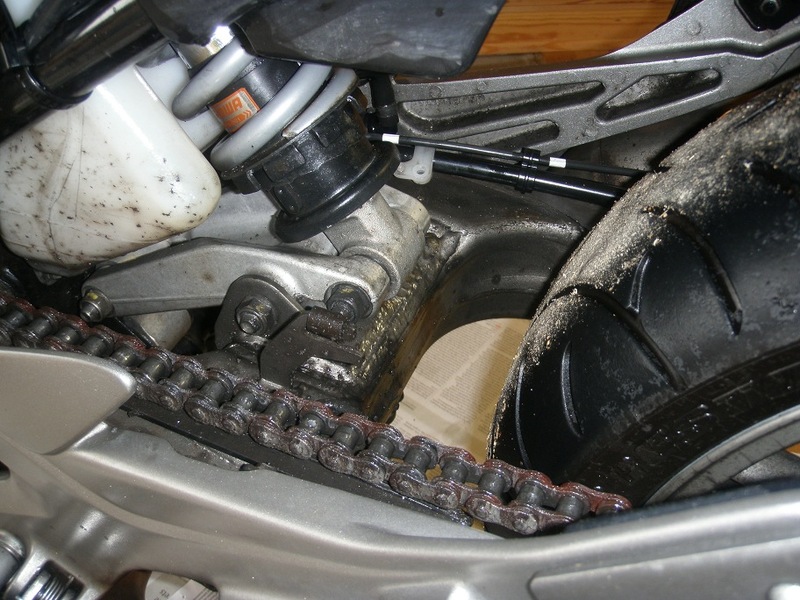 Mount the new rear sprocket with the number of teeth visible and tighten the nuts in a criss-cross pattern to a torque which according to the Honda Shop Manual should be 108 Nm (11.0 kgfm, 80 lbfft). This figure is dry torque so having smeared with copper grease the torque should be decreased a little to say 90 Nm. 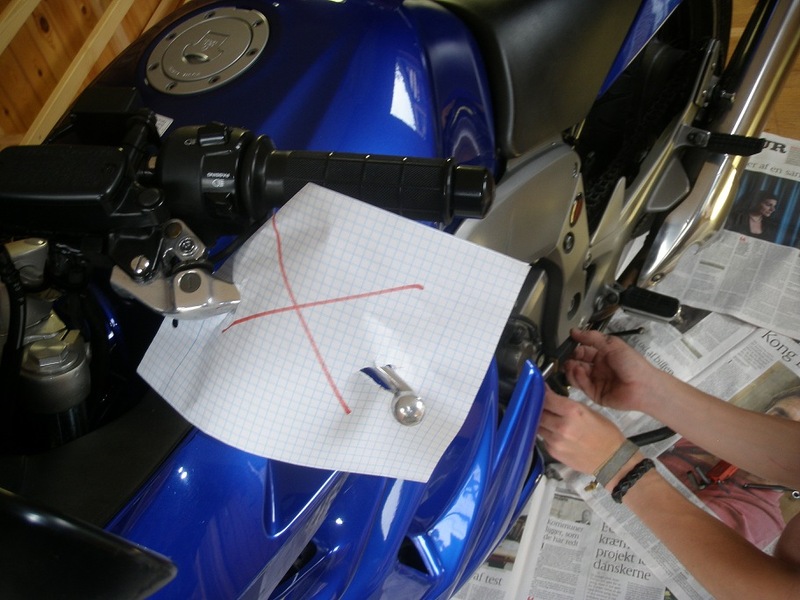 The German repair handbook for CBF1000 from Bucheli Verlag AG however recommends further reduction to 70 Nm, as some Honda specialists claims there is a risc of pulling the mounting studs out of the hub. 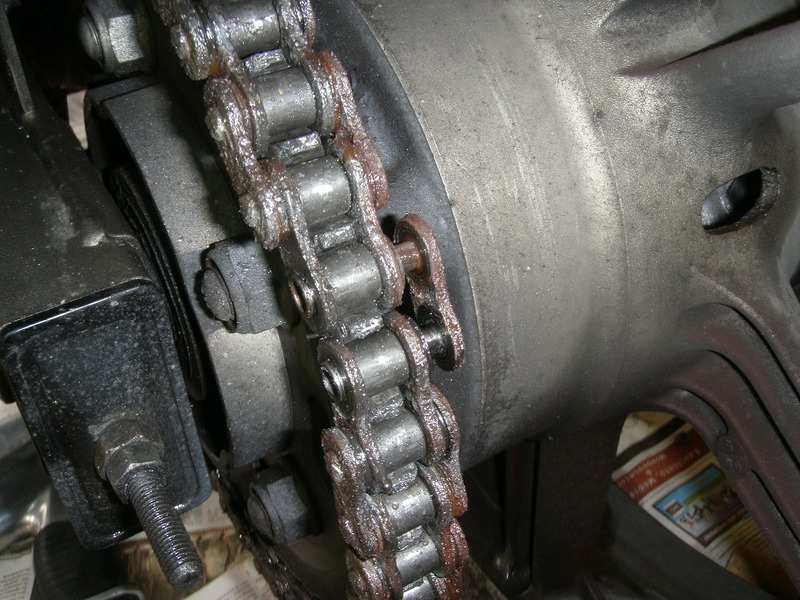 Whichever torque you decide to use, you should keep an eye on the nuts during the follwing period to ensure they do not get loose. Best is to put a dot of paint on the edge of each nut, so you can check that this 'seal' is not broken. 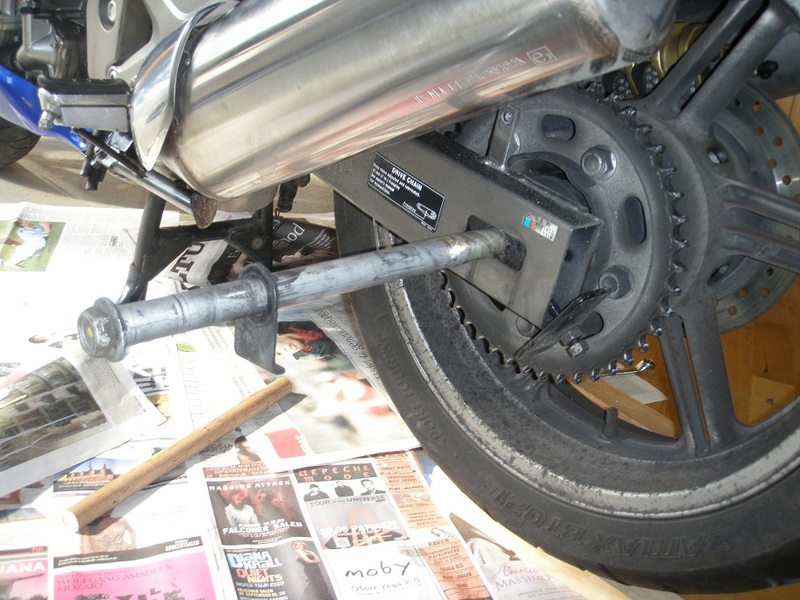 Mount the rear wheel, but do not tighten the rear axle bolt yet. 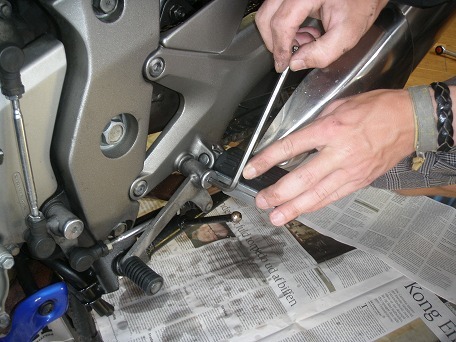 Mount the Front Sprocket, but do not tighten the sprocket bolt yet. That will have to wait untill the chain is on. 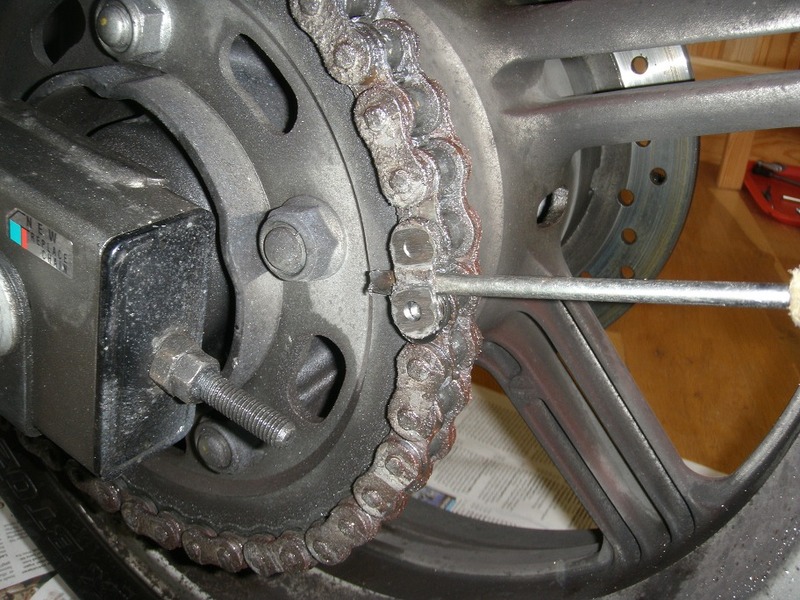 Feed the chain around the front sprocket and place it over the rear sprocket. Make sure there is a well greased O-ring on each pin on the connection link. 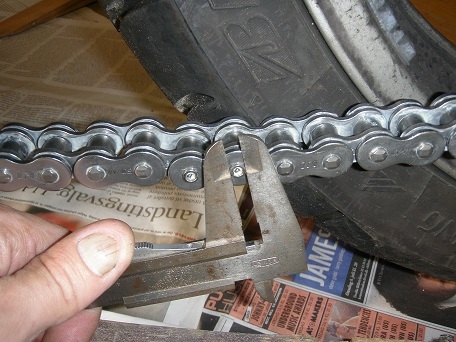 Assemble the chain with the connecting link inserted from the inside out. 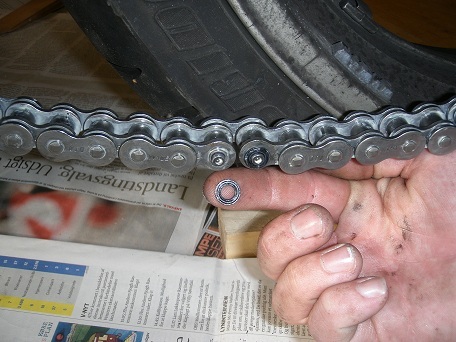 Place two O-rings on the other side of the chain and ensure they are well greased (image below middle). 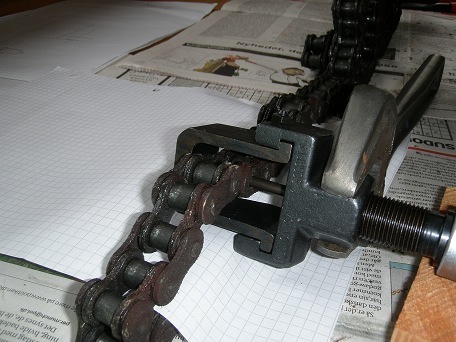 Reference: DID's Chain Installation and Maintenance Instructions. Place the u-shaped holder 'U' arround the chain and slide the body onto the holder. 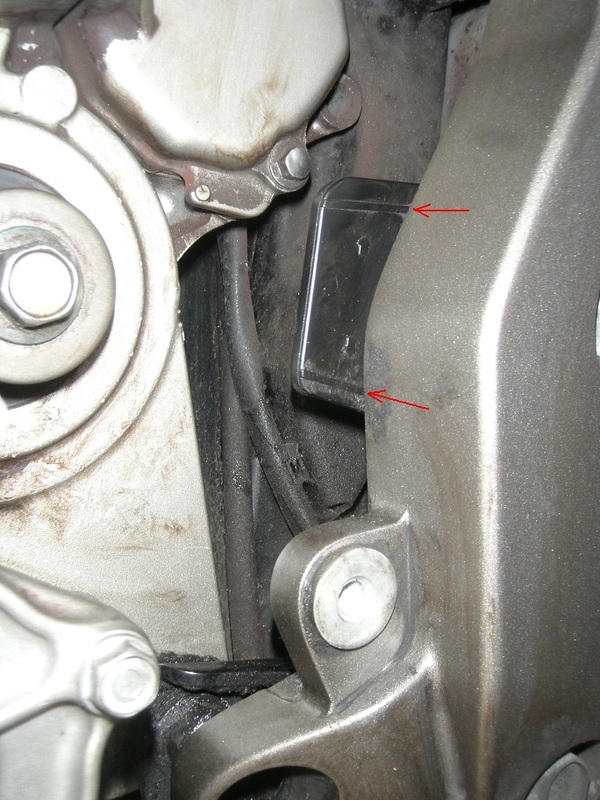 Place the plate holder in the tool between the pin holder and the connection plate. 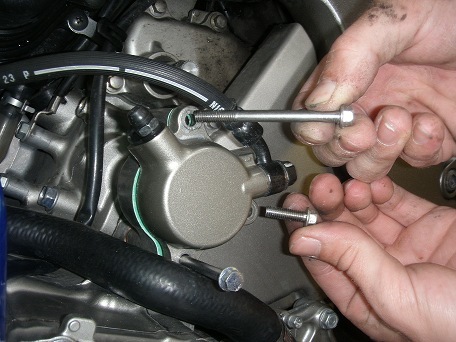 The image above right shows the correct configuration of the tool for this operation. Allign the tool so it is centralized on the connection plate and tighten the pin holder untill you feel the tourge increases sharply, indicating that the connection plate has reached the correct position (image below left). Now remove the plate holder from the tool and slide the u-shaped holder sideways into position B which is marked on the side of the u-shaped holder. 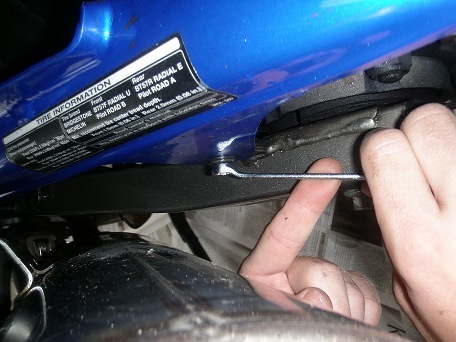 Centralize the riveting point over one of the pins on the connection link and tighten by hand untill the riveting point is in firm contact with the hole in the end of the pin (image below middle). When you tighten the pin holder by hand it is important that you can really feel that the riveting point centralizes itself in the hole. This will ensure that the rivet is not made out of center. 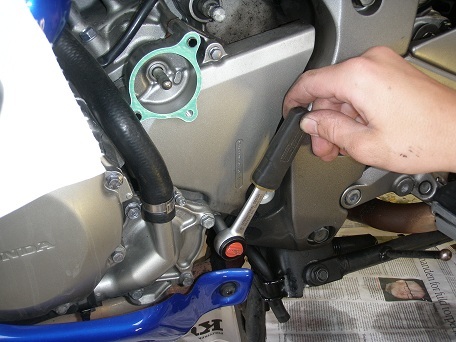 Using spanners - turn the pin holder a few degrees while holding contra on the tool body. You will feel the tourge rising sharply. 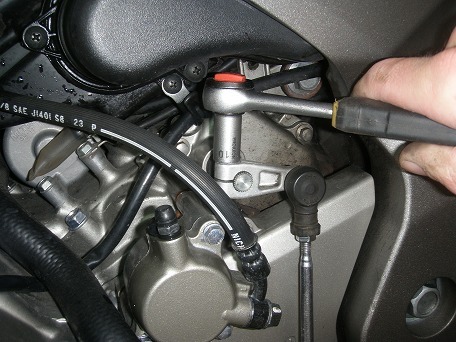 Remove the tool and measure the diameter of the rivet as shown on the right image below. 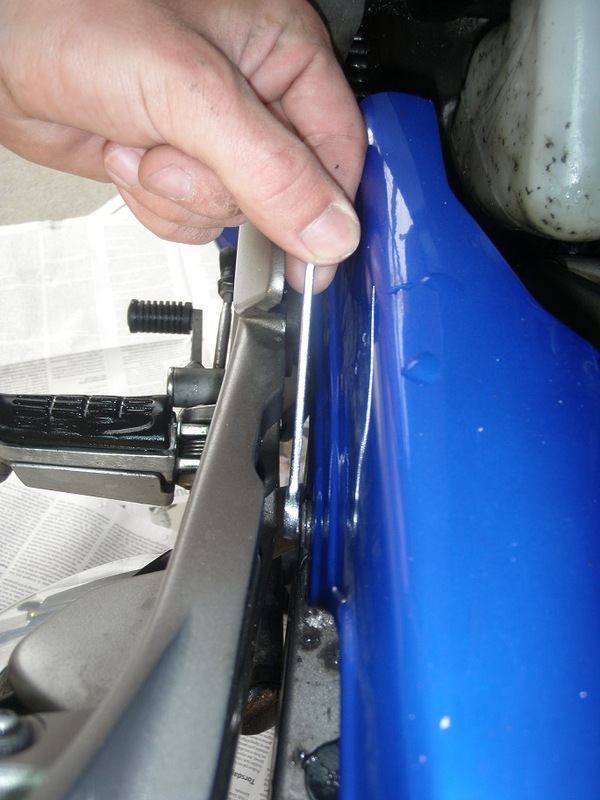 Repeat the above last two steps untill the rivet diameter meassures between 5.5 to 5.8 mm (0.217" to 0.228"). 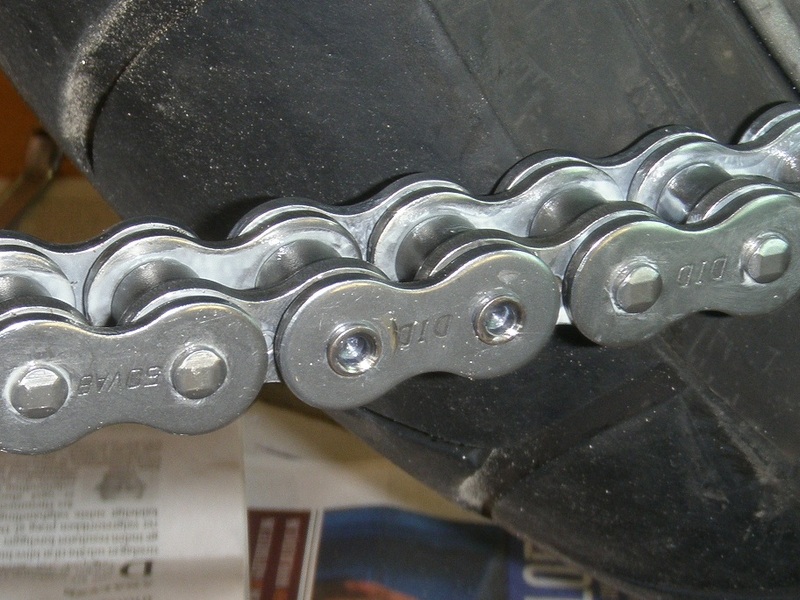 If you mount a chain from a different manufacturer, then be sure to follow the manufacturers specifications. The finalized rivets must look like the ones shown on the above image. They must be symmetrically rivetted to the correct diameter and not have any cracks. 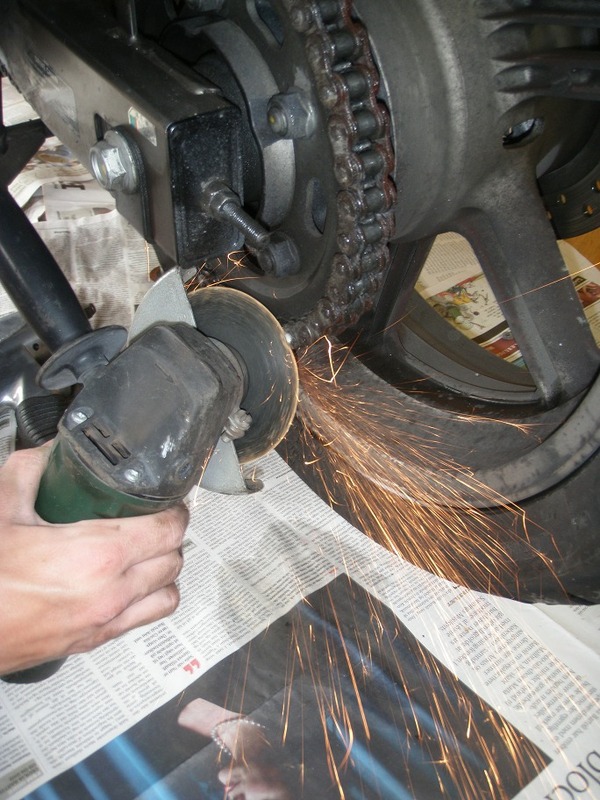 13.0 Tighten the Front Sprocket: Do not forget this! 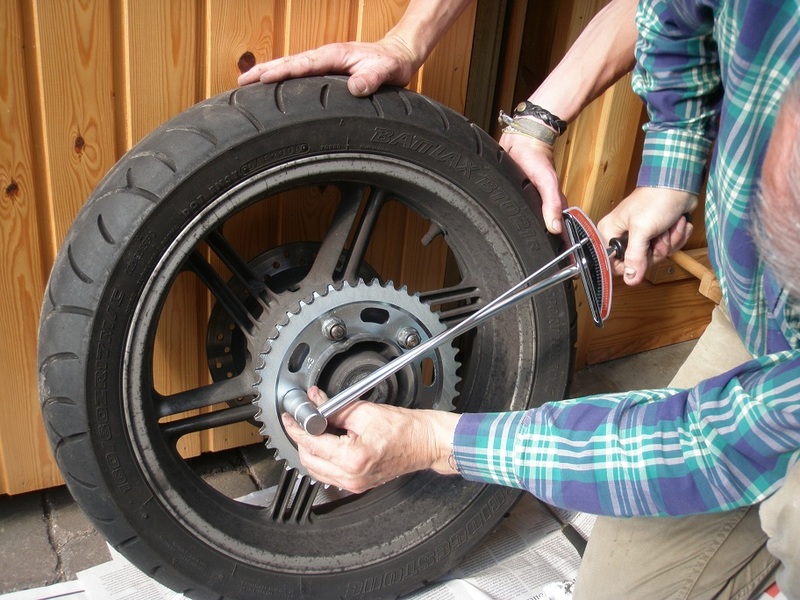 Place the 33 cm long wood stick through the rear wheel again, this time to prevent rearwards rotation and tighten the front sprocket bolt to 54 Nm (5.5 kgfm, 40 lbfft). If you removed the hugger, this shall also be remounted. It may be difficult to mount the front bolt for the hugger due to very little space, so you may want to undo the nut fixating the rear end of the exhaust and loosen the two Allen bolts holding the left footpeg bracket so it can swing a little out. The Allen bolts must be re-tightened with 27 Nm (2.8 kgfm, 20 lbfft). 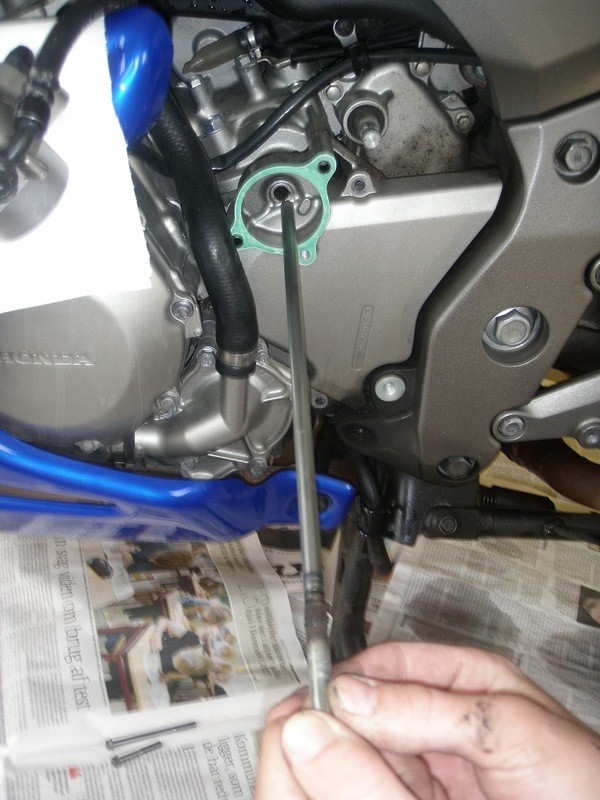 You may smear the rod with a thin layer of silicone grease. Be sure to place it in the correct angle. 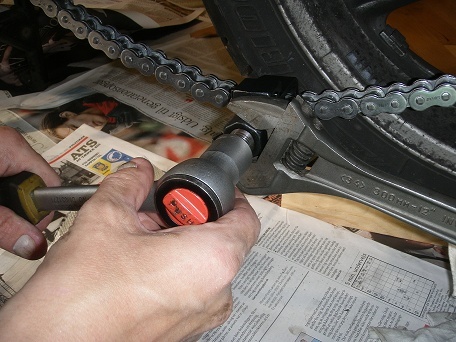 Tighten the large chain adjustment nuts exactly the same number of turns on both sides, untill the chain slack is close to 40 mm. Then, referring to the Chain Maintenance article, adjust the chain slack to approximately 25 mm, and remember to check that the left and right sides are adjusted identically, i.e. that the markings on each side are identically aligned. 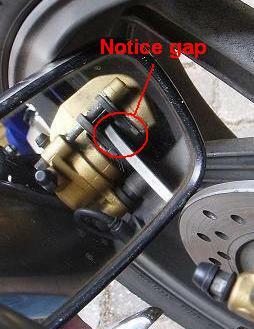 Measure and write down how wide the hole behind the rear axle nut is. On the image below, this gap is 11.0 mm, so when the gap has reduced by 5 mm (the width of the green band) to 6.0 mm, it will be time for yet another chain replacement. The thread Chain Replacement DIY on www.cbf1000.com may be used for comments and feed back, or you may mail directly to me (mail addres is on the front page). 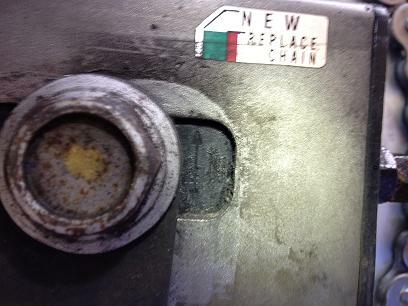 Chain Replacement post by pharis on www.cbf1000.com .